An organization committed to the rescue, rehabilitation, and adoption of horses in need. A place of sanctuary and healing for previously abused, neglected, and abandoned horses. ​A belief that all horses’ lives matter and that hope makes anything possible. 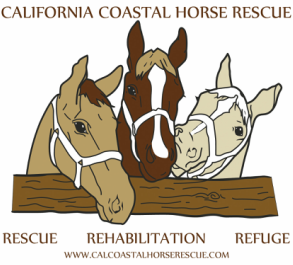 This is California Coastal Horse Rescue and we invite you to join us in sustaining this beautiful Legacy of Hope. There are a number of planned (deferred) giving options, regardless of size, available to you as you consider joining the Legacy of Hope Society. These gifts, through the society, will serve to support the future needs of the horses of CCHR. Gifts by will may be for a specific dollar amount, a percentage of the total estate or the residuum remaining after all debts, taxes expenses and other bequests have been paid. Specific bequests of property such as real estate may also be made. You may also name California Coastal Horse Rescue as a beneficiary in a tax deferred retirement plan such as an IRA or 401(k) plan. The distribution from any of these plans would take place after your death and may be very tax-wise for you and your family. Policies that are no longer needed for family protection or business purposes make excellent charitable gifts, regardless of whether or not all of the premiums have been paid. When ownership of the policy is irrevocably assigned to California Coastal Horse Rescue, the cash value of the policy is a tax deductible gift, as are all future premium payments. By establishing new life insurance policies, specifically for California Coastal Horse Rescue, you are able to make a substantial gift for a relatively modest annual outlay. The following gift arrangements serve to support CCHR today. Gifts are designated as restricted or unrestricted. Unrestricted gifts enable us to respond flexibly and quickly to immediate needs and new opportunities. Restricted gifts well be used to support specific and designated projects. Gifts of appreciated securities provide immediate benefit to CCHR and, in many cases, tax deductions for the donor. Capital gains taxes can be avoided and, often, the full-market value of appreciated securities can be deducted if they have been held longer than twelve months. Real property is simply real estate—a home, farm, or other land. Your home, whether a single family home or condominium, has probably appreciated in value over the years so that its sale would result in a sizeable capital gains tax. By making a gift of property to CCHR you may be able to avoid capital gains taxes altogether. Gifts of tangible personal property such as art, antiques, rare books or coins, stamps jewelry or other objects offer another way of giving. For more information on the Legacy of Hope Society, please contact the CCHR Director of Development via email at connect@calcoastalhorserescue.com or by phone at 805.649.1090.